This post has been sponsored by Rubbermaid BRILLIANCE™. All thoughts and opinions are my own. Have you tried meal prepping yet? I know it can be hard to get organized and motivated to do a bunch of cooking in one day but it is the single best way to stay on track. Imagine opening your fridge and seeing healthy, delicious meals already prepared. 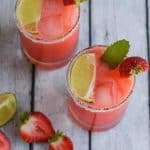 It’s especially easy in the summer because there are fresh seasonal goodies everywhere and they are easy to prep! How dreamy would this be… HELLO, lunch! 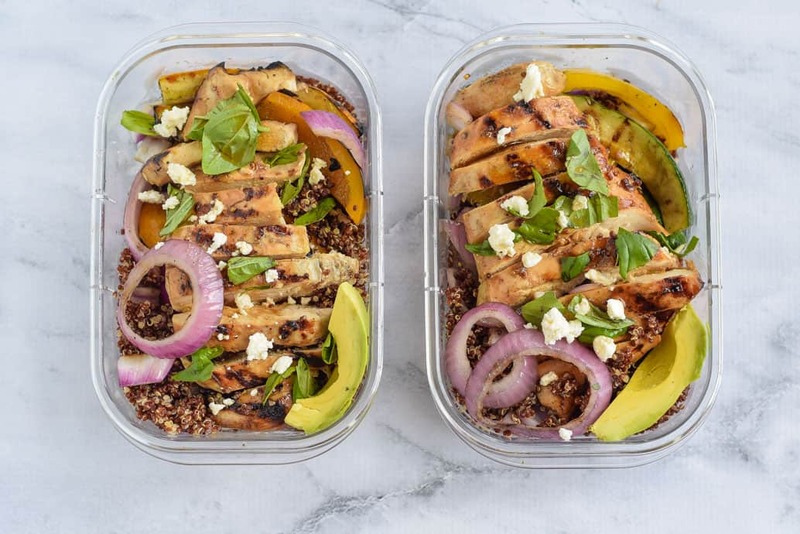 Why not start by meal prepping these simple Meal Prep Grilled Chicken Grain Bowls? Starting with lunches is a good way to get your feet wet, then when you get the hang of it you can move on to breakfast. It makes your week go so much smoother and healthier, I promise you’ll be motivated to continue doing it. Meal prepping all starts with the right containers. I love these Rubbermaid Brilliance containers for storing my prep ahead meals. The containers are BPA free and 100% leak-proof. If you have ever spilled in your fridge, you know how important this is. I love that they have easy locking lids and a modular design so they fit together nicely when I stack them. Because they are clear, I can quickly see what is in them without taking everything out of my refrigerator. Organized fridge – yes! You can even microwave in these babies! All you have to do is unlatch them and they vent through the holes. How cool is that? When you are finished using them, they are easy to clean by putting in the dishwasher. Stain and odor resistant too! Seriously, I have tried a lot of containers and these are my favorite. Check them out at your local Target. What is a grain bowl? A grain bowl is simply a bowl full of protein, grains, veggies, and toppings like nuts, cheese or dressing. 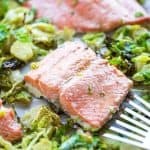 They are a super easy way to combine textures, colors, and flavors to make a healthy dish that tastes great. 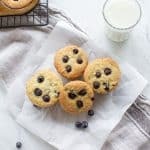 They have been part of my diet for years now and I’m still in love with them. 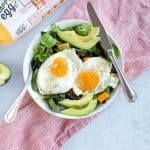 They are also called Buddha bowls, macro bowls, and sunshine bowls. 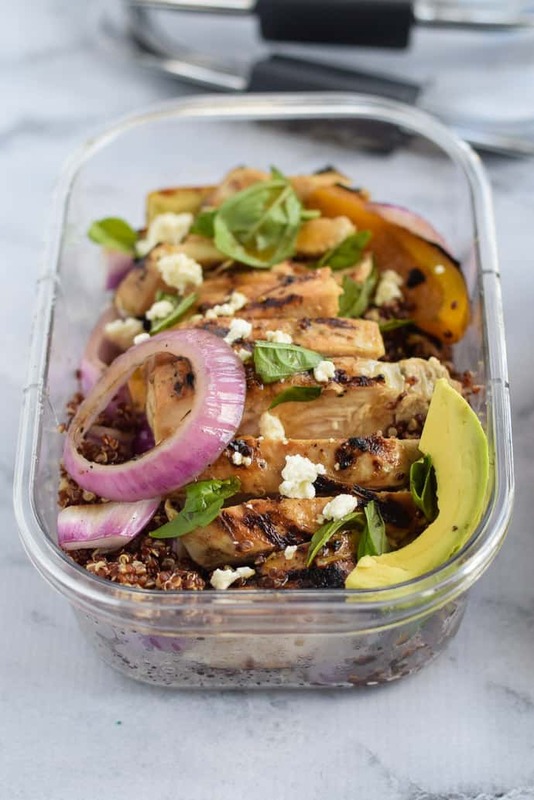 I don’t always prep them ahead…sometimes I throw them together at the last minute with leftover rice or quinoa, protein and whatever balsamic dressing I have in the pantry. The first thing you have to do is prep the chicken. I have said this a million times but always trim the fat and pound them out. Place the chicken breasts in between two sheets of waxed paper and pound them out until they about 1/2 inch thick. This way they cook faster and more evenly on the grill. 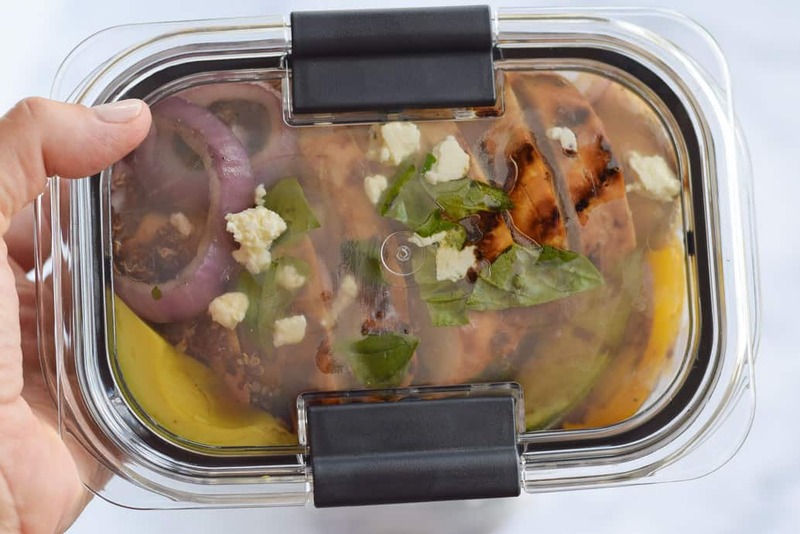 Place the chicken breasts into the Rubbermaid container. Next whisk up the marinade. This is the only marinade you’ll ever need for chicken. Combine olive oil, tamari, garlic, grainy mustard and lemon juice. Whisk it well and pour over the chicken. 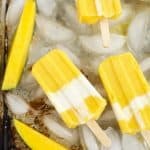 Place the container in the fridge and marinate for at least four hours or overnight. Preheat the grill to medium-high (10 minutes) and oil the grates by putting some olive oil on a paper towel and rubbing on with tongs. Make sure your grates are clean Place chicken on the grill and cook for about 8-10 minutes per side. Brush on a bit of the reserved marinade toward the end of cooking time. Do not move them around. Afterward, put them on a plate covered with foil and let them sit for a few minutes before slicing. If you are using these for meal prep do not slice them because they will dry out. Slice your zucchini, peppers and red onions. Drizzle with olive oil, salt, and pepper. Place on the medium-high grill and cook for about 12-15 minutes. 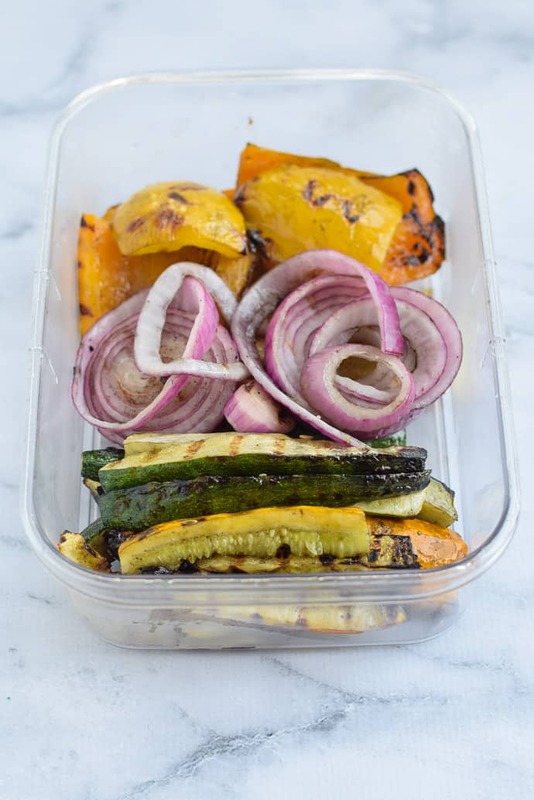 You can also use a grill basket and chop the vegetables smaller. Once you get a little char on the outside you can turn the temperature down so they cook on the inside. 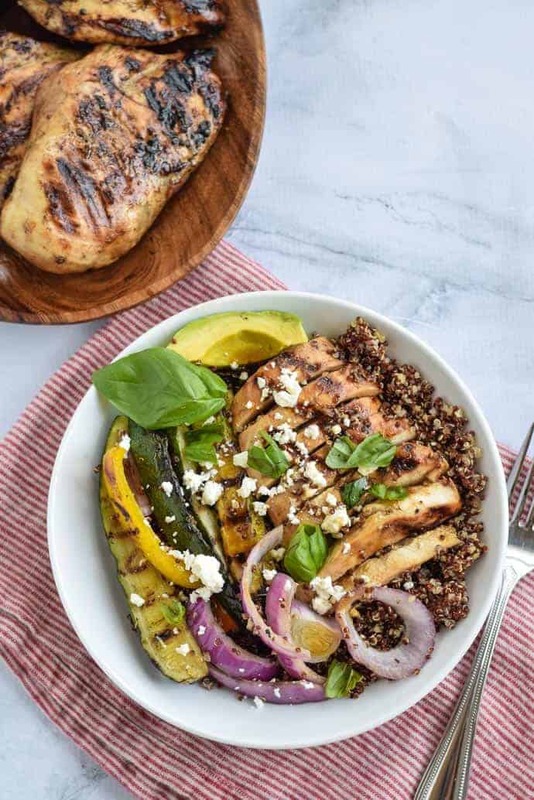 Now to assemble those Meal Prep Grilled Chicken Grain Bowls. 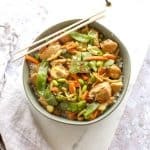 I always have cooked quinoa as my preferred grain in the fridge but you can also use rice, cauliflower rice, barley, couscous, pasta, noodles, or spiralized vegetables as your base. How good does that feel? 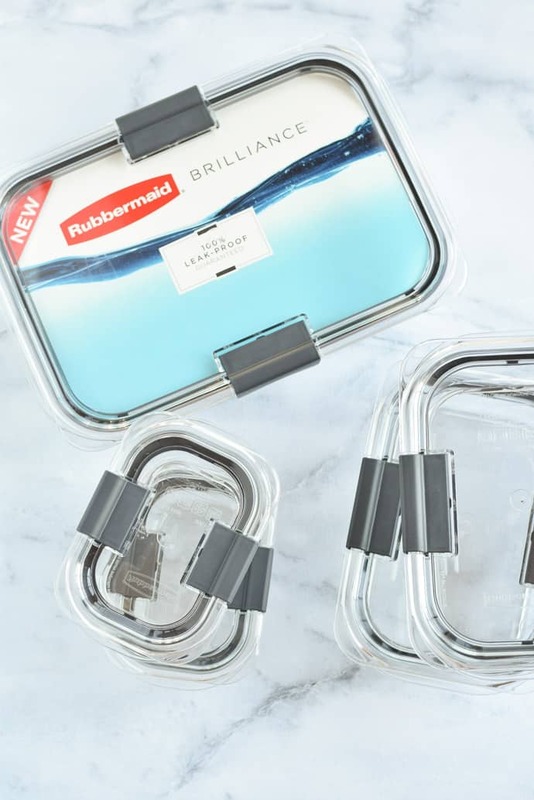 Head on over to your local Target and look for these Rubbermaid Brilliance containers in the housewares section! Trim the chicken of fat and pound to about 1/2 inch thickness. Prepare marinade by whisking all marinade ingredients together. Reserve 1/4 cup of marinade for drizzling on finished grain bowls. 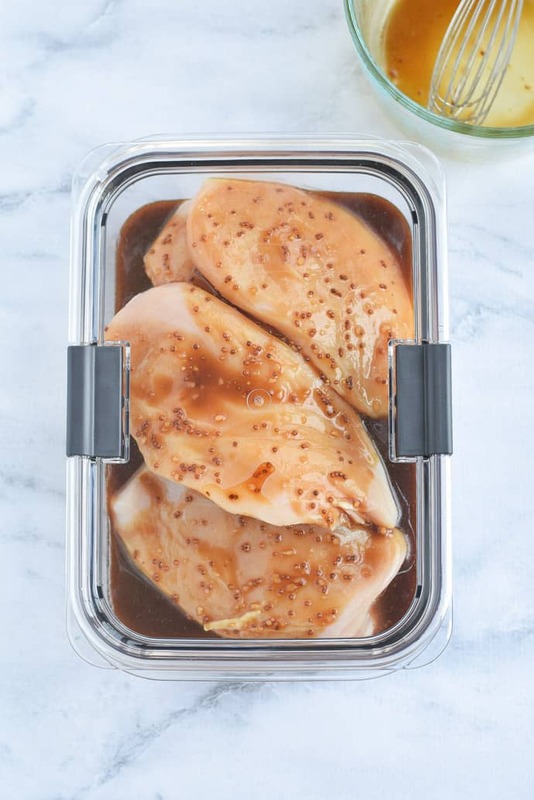 Put chicken and marinade into a Rubbermaid Brilliance container and marinate for at least four hours or overnight. When ready to grill, preheat grill to medium-high heat. Grease the clean grates with a paper towel dipped in olive oil. Cook chicken for about 8-10 minutes per side or until meat thermometer registers 165 degrees F. Put on a plate and cover with foil. Let chicken rest a few minutes before slicing. Drizzle vegetables with olive oil and salt and pepper to taste. Cook over medium-high heat for about 12-15 minutes or until cooked through. Assemble the grain bowls. Put 1/2 - 1 cup of cooked quinoa in bottom of container. Add roasted vegetables and one chicken breast on top. Drizzle with a bit of remaining (clean) reserved marinade and top with feta and fresh basil. They are also delicious with balsamic dressing. Store in fridge for the week. Add sliced avocado right before serving. Here are some Target coupons for August! 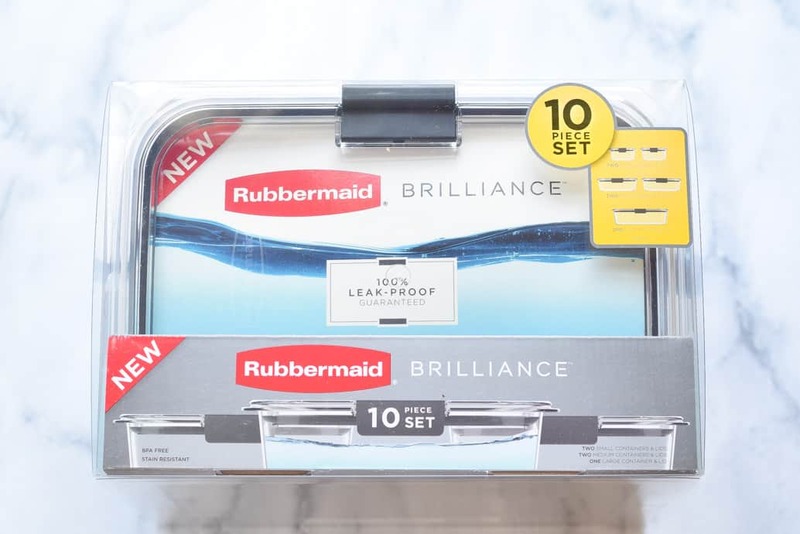 I love this new Rubbermaid product, I just picked some up the other day, what beautiful stuff! Your chicken is pretty nice, too 🙂 I love the shot of the marinating chicken, gorgeous! These containers are brilliant! I have quite a few plastic containers, many missing lids, some quite old and drab. I really should treat myself to some fancy new ones! 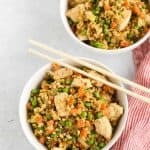 I also love this chicken dish, it looks so tasty and love that it can be prepped ahead of time! Annie you will love these Rubbermaid containers. They are really high quality! 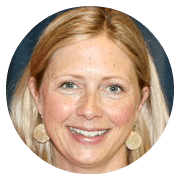 These containers are the bomb, Christine! I have to get into meal prep more often Karen. You’re inspiring me with this post. These bowls sound like something I’d love! Thanks Mary Ann! More meal prep = more beach time! This new rubbermaid product is calling to me. My husband and I are both going to need lunches this fall, and these are portion perfect. Grain bowls are also a brilliant idea. 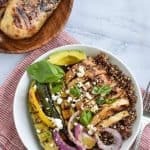 I like to use farro for grain bowls a lot! Yes, I love these Rubbermaid containers! I haven’t tried meal prepping yet but planning on trying! Love these bowls! 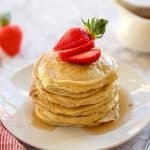 Such a delicious dish! You will love it Julia! Me too! Wish I would do it every week!